LONDON (Reuters) - British Prime Minister Theresa May is ready to agree to a fallback arrangement for the border between the United Kingdom and Ireland which does not have a time limit, to speed Brexit talks, Bloomberg reported on Friday, citing unnamed sources. Arrangements for the United Kingdom's only land border with a European Union state have proven the biggest sticking point as London and Brussels seek to hammer out a transitional deal before Britain leaves the European Union in March next year. Britain's Brexit minister, Dominic Raab, said just a week ago that the so-called backstop designed to prevent a hard border between the British province of Northern Ireland and the Republic of Ireland, must be finite, short and time-limited. However, Bloomberg reported that May and her team of Brexit advisers now accepted the EU's point that it must be open-ended, for an "enduring" solution, citing an unnamed person familiar with the talks. Brexit supporters in May's government are concerned any temporary arrangements with the EU that lack a clear time limit may become permanent solutions over time. Sterling strengthened by around a quarter of a cent against both the U.S. dollar and the euro after the report's publication. May's office had no immediate comment on the report. 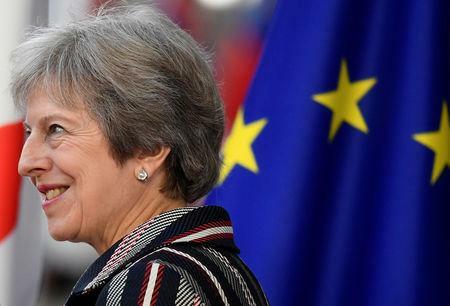 Earlier on Friday she told businesses that other EU leaders wanted to reach a Brexit deal as soon as possible, and that any Northern Irish backstop would only be temporary.